Stores Ref. 6D/1837. Mask, Oxygen, Type M, Mk.2 complete with microphone assembly, type 71. Black rubber mask with fabric harness & 'butterfly' clip fastening. These masks were used in early Hunters, Javelins, the Canberra PR9, V-bombers and the Lightning. 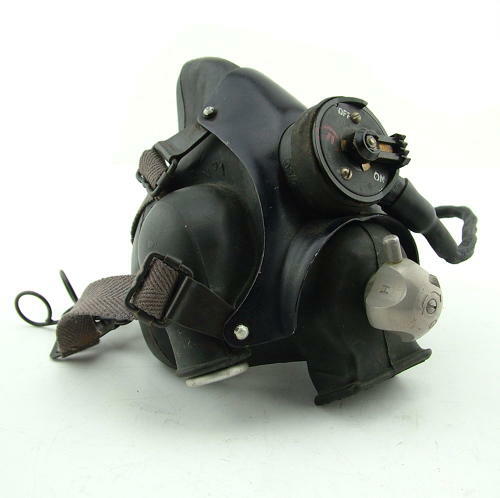 The Type M, MK.2 mask was intended to be used in place of the Type M & J masks. It was part of the pressure breathing equipment issued and was only to be worn in conjunction with a pressure breathing waistcoat, Mk.1 or Mk.1A. Not fitted with an oxygen tube or pressure suit tubing/valves. The facepiece is in very good damage free condition remaining supple and quite clean. Some soiling/marking. The wiring loom, microphone and harness are also good. Stock code O19119.